(1913-1981) was a rare being and is considered to be one of a handful of Indian saints who lived during the 20th century. His very presence was a privileged opportunity for those who had the fortune to know him. A renowned master of Kundalini Yoga, he received early training from his guru, Swami Pranavanandji (later revealed as Lord Lakulish, the 28th incarnation of Lord Shiva and affectionately referred to as Dadaji) and sannyas initiation from Swami Shantanandji Maharaj. After training the young Kripalu intensively for 15 months, Dadaji mysteriously disappeared. Kripalu went back to his previous life, but eventually renounced his worldly attachments to became a swami, immersing himself in the study of scriptures and giving lectures as he wandered Gujarat. After an absence of 17 years, Dadaji reappeared and guided Kripalu in his formal yoga sadhana and instructed him to rebuild the ancient Tirtha Seva Samaj at Kayavarohan, now a sacred pilgrimage destination. 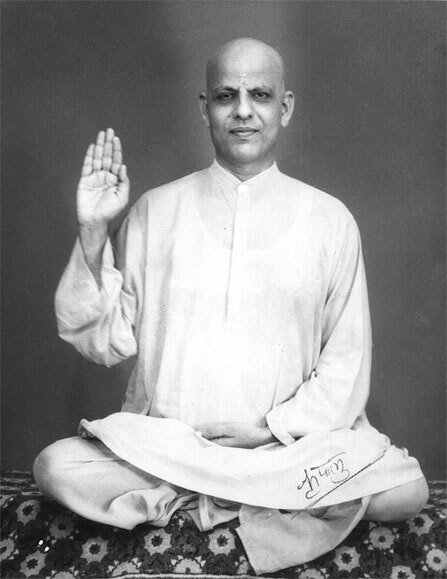 In 1947, Swami Kripalu was lecturing on the Bhagavad Gita in the small town of Halol. It was there that 16-year-old Amrit Desai became enamored of his teachings and was privileged to serve him closely. Later, Yogi Desai brought the teachings of the Lakulish Lineage to the West in 1960. Swami Kripalu’s other close disciples, Rajarshi Muni, Ashutosh Muni, Vinit Muni and Yogeshwar Muni (Vinit and Yogeshwar are now deceased) also continued the Lineage. Swami Kripalu’s extraordinary life is chronicled here to serve as homage to his legacy and as inspiration to those who aspire to learn from enlightened this master of supreme consciousness.